I was doing some work on my computer when I glanced through the windows. There were some nice sunset colors in the sky. So I went outside to enjoy the show. 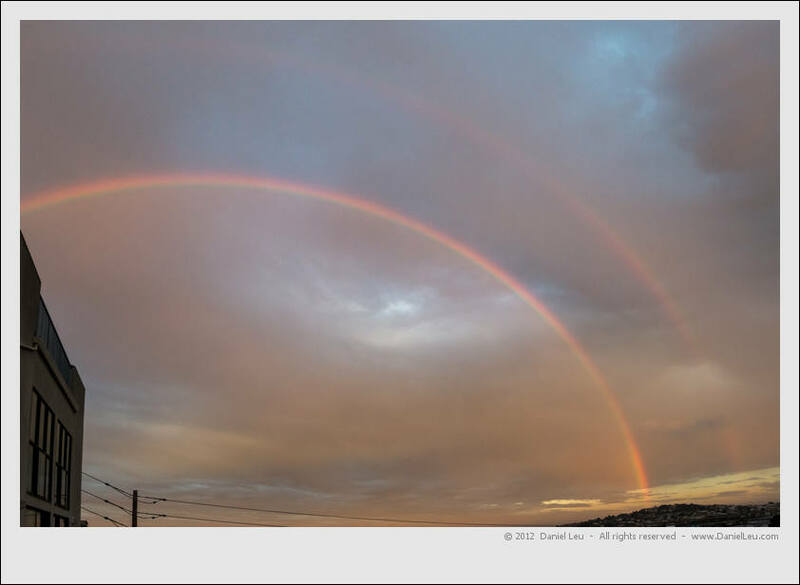 When I turned my head eastwards, I was stunned: a huge double rainbow was up there. A quickly grabbed my camera to shoot some pictures. This was the first time I saw such a huge double rainbow. My head was spinning: where can I go quickly to take some more images with a more pleasing foreground. Up the road is Starr King Openspace with some nice trees. Luckily when I arrived, the rainbow was still up there and the sky was even more colorful. Wow! @Vault Wholesale, please accept my sympathy for your loss. The picture was taken at 7:34:55 pm. Thanks very much for the pix. Could you tell me what time they were taken? My Dad, a brilliant artist, passed away late Wednesday afternoon. I like to think this was his last broad strokes across the sky on his way to the next world. Thanks! Yeah, the rainbow was huge. Never saw this before. When I took my camera out of the bag, it had my 16-35 attached. Was indeed lucky tonight. you lucky dawg, and would you believe i was almost going to take my 12-24 lens but decided against it? i took ONLY my 18-55 and it would NOT fit!!! you luck dawg! !